Kitchen 101: DJ! B-B-B-Break it down! | I'm Gonna Cook That! Kitchen 101: DJ! B-B-B-Break it down! Touching raw chicken is icky. I’m getting that off my chest. I like chicken. I love cooking it and I love eating it, but I do not love touching it. Of course, as someone who wants to teach others to cook for a living, I realize it’s not the most inspiring thing to see your instructor making the “eww” face when handling an ingredient, so I’ve pretty much come to terms with the fact that barring me going militant vegan (NOT gonna happen), raw animal product and I are fated to be in contact. – Understanding the anatomy of the animal helps you know how each part of it should be prepared. – Seeing the whole animal, or at least a larger part of the animal than just that nice, neat, packaged bit that’s already broken down for you, puts you face to face with the fact that this was once a living being, and if you’re going to eat it, I believe it’s important to honor the fact that its life was taken to provide sustenance for you and your family. I realize not everyone will have access to (or will ever really want access to) the entire process of raising an animal for food, but acknowledging that the act of eating meat does not begin with my trip to the grocery store feels important to me. 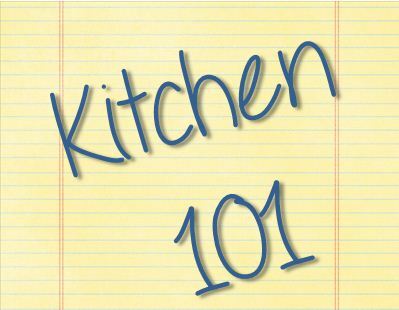 – And then, once I’m done with that little preachy bit, we’ll finally get to the “meat” of this week’s Kitchen 101– It will save you money to break down the meat yourself. Most of the time, whole chicken costs less per pound than cut up chicken parts. In terms of yield, you’ll get more usable meat from that whole chicken by breaking it down yourself than you would from a whole, cut up chicken. From one whole fryer chicken you will get, at minimum, two large breasts (which can be further broken down into cutlets), two thighs, two legs, two wings (throw ’em in the freezer and eventually you’ll have a dozen or so that you can turn into an appetizer), plus the carcass, which can be used to make chicken stock. You can generally get (depending on how you’re preparing it) at least four meals out of that for a family of four, even more if you’re just a couple or a single. The chicken fat, which is referred to as “schmaltz”, can also be used in place of other types of fat or oil for sauteing or making sauces. When you buy a whole chicken, you’re also not paying for extra packaging or the cost of having someone else break it down for you. You also may not have realized the potential food safety factors. A whole chicken is handled/processed less than a cut up chicken, thus reducing the risk of exposure to pathogens that lead to food borne illness. If you take what you’re saving from buying a whole chicken vs. the more processed one, that might give you the extra three or four dollars you’d need to buy an organically and locally raised chicken, vs. one from a factory chicken farm. That means some of those “throw away” parts you might normally avoid using (like the bones, the skin, and the fat) can be safer/cleaner to eat. And now that I’ve told you all that, you might be wondering about the most efficient way to break down a whole chicken. If you’ve never done it before, it might take a few tries before you’re able to get the full yield of meat from a whole chicken, but once you get a feel for it, and an understanding of the anatomy, it will become second nature. I had a video for you from my instructor to demonstrate the process of breaking down a chicken. It’s a good one, and fairly entertaining, to boot. However, I looked at several others, as well, and found one on BuzzFeed Food’s YouTube channel that demonstrates a method that I think is incredibly approachable for the average home cook. I realize that sometimes it’s simple time saving convenience that might cause you to just get the parts you need vs. the whole chicken. That’s ok. I’d never tell anyone they have to do something. However, I do recommend that you try it enough times to get this skill into your bag of tricks because it’ll just be another thing you can do that makes you feel more confident and capable in the kitchen. ← Happy St. Patrick’s Day! Let’s get lucky. Great info. I went to culinary school and one of the first things they taught us was how to properly break down a chicken. I still don’t have the knack for it. I am going to save this video! I am by no means an expert yet, but I followed as much of that video’s method as I could remember last night when we were breaking down chickens in class and I ended up with much cleaner pieces and a lot less meat left on the carcass. I’m going to practice it again this weekend (we have practicals next week, gulp!) and see if I can get my total time down.